Back in January I posted a list of the 42 top social media tips and tools I came across over a six-month period. This is an update with 43 more I’ve found over the last few months. Your RSS reader may give you information, but it probably won’t help you discover new, interesting sites and follow bloggers’ discussions on a subject. This is where these sites can come in handy. Lee Odden provides a great list of web analytics tools. CommentPress is an open source theme for the WordPress blogging engine that allows readers to comment paragraph by paragraph in the margins of a text. Powerful plugin that allows you to insert frequently-used snippets of HTML and text, but also allows you to create mini-plugins of your own. It doesn’t get any easier to create a blog/wiki site. WordPress theme that provides self-hosted twitter-like functionality. Shannon Whitley combined the WordPress Twit2RSS plugin with some simple coding to let you display the links your twitter friends post. A simple plugin for the Microsoft Windows Live Writer that adds an “Insert Thumbnail of Url” option. Tips: Where Can You Find Good Images? Garr Reynolds gives a list of 23 photo resources. A series of how-tos for creating navigation buttons in Photoshop. Three useful resources if you need to come up a colour scheme. Search engine for free photos. A fun web 2.0-style logo creator. HelloTxt lets you update multiple social media sites with one click. Also see Twitku for a similar tool. If you are an Outlook user, you probably have it open all the time. Now you can update your Twitter status and follow your friends without having to open any other applications. Quotably lets you track Twitter conversation threads. A few bugs, but generally very effective. Kevin Dugan lists some useful tools for Twitter. Interesting tool that graphs your Twitter usage. Primarily useful for satisfying personal curiosity. Twhirl is a desktop client for Twitter, based on the Adobe AIR platform. Neat little tool for getting a snapshot of what’s being talked about on Twitter. A little superficial but useful if you’ve been out of it for a while. Useful social bookmarking widget for blogs. Plug-in lets you check to see if stories have been submitted to a series of social bookmarking sites. Votrs.com is a URL shortening service that makes it easier for your friends to vote for stories on your favorite social sites. Courtesy of Todd Defren and SHIFT Communications: a one-slide Guide to Social Media Release Capabilities Across the Major Wire Services. Now, use PRX Builder from inside WordPress. Post your Social Media Release right to your blog. podcastFAQ.com is a website committed to providing everything you need to know about podcasting. This site aims to contain the most up-to-date information for podcast creators, consumers and businesses. Useful audio/slideshow presentation by Steve Lubetkin. Great detailed list of current forms of web marketing. BookletCreator is a free online tool that allows to create a booklet from a PDF document. It reorders pages so that after printing and folding the pages you get a small book. Email files of up to 1Gb. Fast, simple and secure. A whole bunch of IP and DNS tools. Converting media files made easy. Embed a news bar on your web page and let your users see headlines and previews of Google News Search results that you’ve selected. Customize how the news bar should be displayed, and this wizard will write the code for you. A resource of over 2,800 mashups. Sprout is a quick and easy way for beginner and pro users to create living content including websites, banners, videos, music, photos, RSS feeds, calendars and more. TagCrowd is a web application for visualizing word frequencies in any user-supplied text by creating what is popularly known as a tag cloud or text cloud. 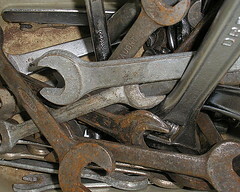 A great list of free software tools. Mark up websites, graphics, and photos, or start brainstorming on a blank canvas. Browse the web with your friends or make that conference call more productive than ever. No plug-ins, downloads, or firewall voodoo – it’s all here, ready to go when you are. Browser-agnostic, user-friendly, mom-approved. Oh yeah, it does one-click audio chats too. Find out how well your site is doing in popular search engines, social bookmarking and other site statistics. Damn it David! Now where I am supposed to find the time to go through all these wonderful sites. Many thanks for taking the trouble to put this together. Wow, Its hard to keep up with the number of plugins there are.